Nathalia Sophia Barat, a.k.a. Vida Sophia, is an exciting newcomer from the Danish underground scene. The promising Copenhagen-based star, who was chosen as one of 20 Danish names to make it big in 2016 by Spotify Denmark, unveiled her debut EP Soundtrack earlier this year. 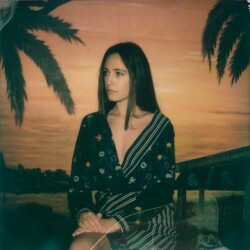 Her brand new single, “I Never Surf,” is a gloomy summer single revisiting the 60s, and is due out this week. It is the first track from her upcoming follow-up EP coming in November 2016. Earlier this year the Danish/Israeli singer caught the attention of Brazilian youngsters with her single “Royal Line” which was added to Spotify Brazil’s playlist Música do Dia. This was quickly reflected in Vida Sophia’s top 5 cities on Spotify, all Brazilian with the biggest one being São Paulo. In fact, 80% of all Vida Sophia’s streams on Spotify come from Brazil. Vida Sophia’s label, Nordic Music Society, quickly realised the Brazilian potential and did exactly what is recommended in our blog post, How, Why, and When to Advertise Your Stuff. The post will give you the step-by-step thought-process you need to consider before spending money on advertising. To highlight a few used in this instance, Nordic Music Society particularly researched (and realised) her potential fans and identified her target audience. They then decided to create a targeted post on Facebook targeting women aged 13-28 living in larger Brazilian cities. The post was written in the local language, Portuguese, and included a direct message to the Brazilian audience: “Hi Brazil, my new EP is out now.” The label budgeted $150 towards the Facebook ad and ran the post for 7 days. The post was created on the 13th of June and received more than 9.2K likes! When it was shared, Vida Sophia had approximately 500 Likes on her Facebook page. After 7 days, Likes had increased by 280%, and didn’t stop there. On the 4th of August, Vida Sophia’s Facebook Likes had increased a further 165%, bringing its total increase to a whopping 460% — a phenomenal rise in just 7.5 weeks. 65% of all Likes on her page are from Brazil and women ages 13-17 make up her biggest audience. The ads have shown incredible success and although there is still room for growth, Vida Sophia has managed to build a notable following with just $150, simply by striking while the iron was hot. Of course, Facebook ads are only part of a larger strategy, but capitalizing on every opportunity is key. In this instance, Spotify created a foundation and Vida Sophia acted upon it. Remember to always communicate with your client manager at The Orchard; we love seeing our artists do well in unexpected territories and are here to help you maximize these growth opportunities. We have local retail teams around the world who know their markets and have the relationships to support your releases globally. One thing is certain: our Brazilian colleagues can’t wait to pitch Vida Sophia’s newest track “I Never Surf”, out this Friday.